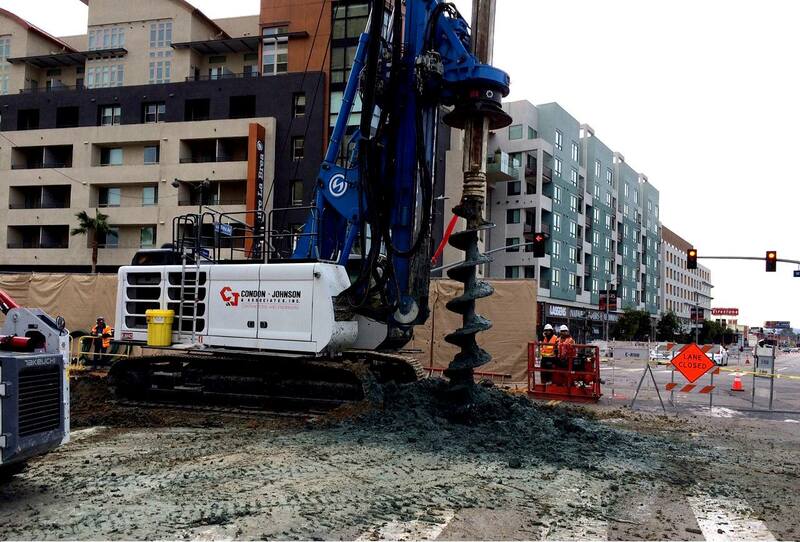 Workers drill a section of Wilshire Boulevard as part of the Purple Line Extension project’s piling operation. Metro’s Purple Line contractor will perform a traffic switch on a portion of Wilshire Boulevard between Detroit and Mansfield this weekend with work running from 8 p.m. today (Friday) through 6 a.m. Monday. Traffic switch means that traffic will move from the north side of Wilshire to the south side to accommodate the work. This is part of the work to prepare for the Wilshire/La Brea decking operation scheduled to start in June. Please see the construction notice below for details. Traffic Switch for Pile Installation, South Side of Wilshire Blvd. SummaryBeginning at 8 p.m. Friday, April 15th thru 6 a.m. Monday, April 18th, the design-builder will implement the worksite traffic control to begin the piling operation on the south side of Wilshire. This traffic switch will require setting concrete barriers (K-rail) with fencing on the south side of Wilshire from Detroit to Mansfield, and restriping of the street. Similar to the current configuration on the north side, this traffic setup will reduce Wilshire to two lanes each direction. There will be left turn restrictions on Wilshire from Cloverdale to Mansfield. Intermittent lane reductions on Wilshire between Cloverdale and Highland. Work activities will start behind the existing closure on the east end (near Wilshire/Orange) and move south, and west down Wilshire to Wilshire/Cloverdale. Intermittent closures of Orange and Sycamore for street restoration. Traffic signals on Wilshire between Cloverdale and Mansfield will be shut down intermittently. The north leg of Sycamore at Wilshire will be closed to support appendage pile installation. Southbound La Brea will be reduced to two lanes between Carling Way and Wilshire. This closure will be removed by Monday, April 18th. TIME: Friday April 15th 8 p.m. – Monday, April 18th 6 a.m. High-noise activities completed during daytime hours before 11 p.m.
Access for pedestrians will be maintained outside of the construction zone. Temporary fencing will be erected to ensure public safety. Construction may result in changes to bus routes and stop locations. Metro will post signs at affected stops to advise riders of alternative boarding locations. Real-time information will be available at metro.net/service/advisories or 323.gometro.